I was rushing to get dressed for Shabbat when I heard my husband mutter, “Oh no…” loud enough for me to hear from behind my closed bedroom door. “What’s the matter?” I called to him. 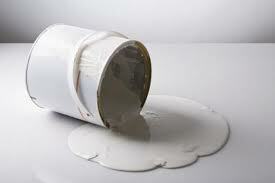 When I opened the door, I saw my husband looking down at a puddle of white paint in the middle of the hallway. Actually, make that a small pond of paint. Half a gallon to be exact. Turns out that my 5-year-old Yoel had needed to reach his white Shabbat shirts which hang above the washing machine, and to do so he stood on the aforementioned container of paint, which subsequently belly-flopped. But my husband didn’t curse or yell or lose his cool. In fact, he began to laugh. 4 years ago my husband was visiting his hometown of Kingston, Ontario when he heard a Country music song on the radio that has since become the Weisberg family anthem. And to this day, singing this song and laughing is our gut response to the frequent minor disasters that are part and parcel of raising a big family containing many little people. New Personal Development Chabura Starting: Don't Miss this Opportunity of a Lifetime! THANKS! That was worth watching. Hopefully, we will learn to really live each day and appreciate it, spills and all, and so be able not just to not-regret, but to rejoice, further down the road. Thanks again. I would probably never have heard that song otherwise. so true! great song and lesson! Just saw this now. I love it! Had tears in my eyes…..